RFID has been a buzz word for anyone who is interested in any type of item identification. Until now, barcode has been the most trusted identification system and has served many companies for decades. However, RFID (Radio Frequency Identification) is a technology that uses chips smaller than a grain of sand to track or identify objects at a distance. Although RFID may not be the right replacement for barcodes in all circumstances, it offers some advantages you can choose to make your business easier. RFID implementation in your company is more complex than using simple barcodes, but we will help you learn what you need to know to get started. LF (low frequency) low-frequency RFID works at the frequency of 135kHz and has a very short reading range (2cm or 5cm normally). This type of RFID essentially requires contact with a reader to capture the data. While this type is not useful for tracking products, you will find it embedded in IDs and other applications for access control/parking, authentication and event attendance management. High-Frequency Frequency RFID operates at the frequency of 13.56MHz and has a short reading range of about 12cm normally, but with specialized readers and larger tags, it can reach almost 1 m. HF RFID tags have fewer interference problems than UHFs, while their range is limited, they are a good solution for labeling small objects on automated lines. High-speed reading is also possible, making HF a good choice in healthcare environments where small vials and samples need to be read. RFID readers are available in 2 different types, depending on how you are collecting data. Fixed readers are used to create portals for automated reading. With a fixed reader, you will normally have 2 to 4 antennas attached to it to read the tags as they pass. This type of reader is commonly used to read labels as they enter a room, pass through warehouse dock doors or travel on a conveyor line. The reader itself will connect to a host PC to its network to transmit all data from the tag. Because these readers are typically used in automated applications, they typically have additional connections to support external display sensors or light cells to notify users of full readings. Mobile RFID readers are the same as a standard mobile, but with the addition of a RFID antenna and a reader. 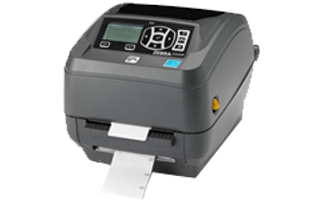 These types of readers are made for manually reading moving labels and will also have scanning barcode capabilities. 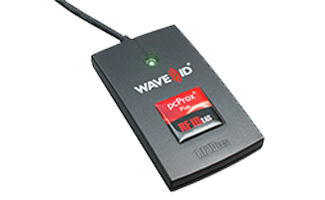 All scanned RFID data can be used in software that runs locally on the device or is sent to a larger system over a wireless network. Many RFID installations will use both fixed and mobile readers. A passive UHF (Ultra High Frequency) system has four main components: the tag, the antenna, the reader and the host PC. The reader is scanning each antenna connected to it so that once a tag enters the field of one of the antennas, it is turned on for the first time. This is the most delicate part of any system, as this is where interference comes in. Liquids absorb the projected signal while metals will reflect it. Depending on what you are tagging, where the tag is placed and how many articles you try to read at a time, the performance of any system will vary considerably. In cases where the tag is successfully activated and read, label data is processed by the reader and sent to the host PC. Your host server will be running some type of software to put the tag information ready to use. This could be an asset tracking software, an inventory management system, or even an event tracking application. Like barcodes, RFID tags are a simple identifier, but tags can be read faster and automatically without site-line or orientation concerns. Since each tag will have a unique number on it, how it tracks items will only be limited by its needs and software capabilities. Regardless of the frequency range, RFID systems can be passive or active. This difference refers to whether RFID tags have their own power source (battery). Active tags are much more expensive and will usually have a larger size. Since they have their own power source, active labels have a higher read range and can be read at high speeds. For Auto-ID purposes, passive tags are the most common because you can create tags that are slim enough to be tagged and cost only around $ 0.10 to $ 0.20 instead of $ 25 to $ 100 €. With a passive tag, the reader actually activates the tag which then returns its data to the reader. All that we cover in the following will focus on passive UHF technology since it is the best fit and the most used to track the products. Through this overview, you have learned some basic RFID concepts and the basic components of any system. RFID technology can be a very powerful tool in a wide range of applications for all types of businesses, but it has also seen that it is not an out-of-the-box solution either. Each RFID installation is unique and requires a lot of planning and testing before making any final decisions. In many cases, companies will begin with a limited RFID facility. They start with a single portal or only a few mobile readers. As the test process and pilots develop, it is possible to deploy a system to larger scales. Finding the right RFID solution is always a challenge and having the right resources and support is critical. If RFID sounds like an appropriate solution for your business or if you have additional questions, do not hesitate to call our experts. We will always be happy to help you find the right solution for your needs.